Steam Traps reliably discharge condensate, air and inert gases from steam plants and close off steam tight. The range of products offers the best choice of steam trap with the highest energy efficiency and durability, easy to maintain for your applications. TLV is renowned for its innovations and the way in which the improve the efficiency and longevity of steam systems through the products they develop. 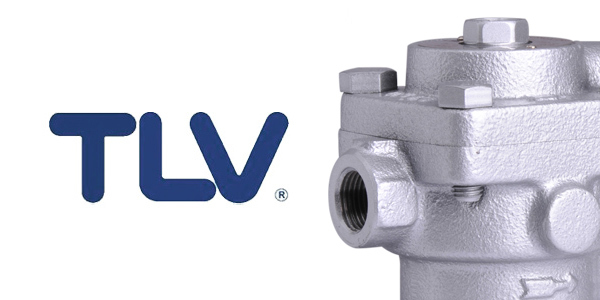 One of the standout innovations that TLV can offer is the Free Float Mechanical Steam Trap. To protect the valve set against dirt and scale there are always strainer screens or even complete strainers with access from the outside integrated in the design. Reusable PTFE body gaskets are used up to operating temperatures of 220°C. Mechanical steam traps are a known weak point in any steam system often succumbing to component failure and causing either steam leaks or not allowing condensate discharge; both of which will cause efficiency problems in the process and more seriously could cause major safety concerns in the plant. The traps themselves and their complex mechanisms, incorporating float, lever and hinge provide multiple points of failure that are vulnerable to pressure, corrosion and mechanical interference. TLV developed the Free Float in response to the above problems that other manufacturers saw with their mechanical steam traps. Designed with TLV’s philosophy of “Simple is best” the free float range’s uncomplicated, elegantly simple solution all but eliminates these issues. When the trap is cool, a thermostatic capsule (X-Element) contracts and valve port (A) opens wide to continuously discharge initial air. As cold condensate enters the trap, the float rises to allow discharge of condensate from valve port (B). 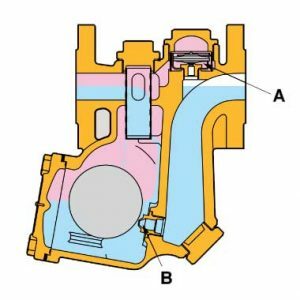 Once all initial air and cold condensate have been discharged hot condensate heats the X-Element which closes valve port (A) before steam reaches the trap. Condensate which enters the trap continues to be discharged through valve port (B). Air or retained condensate entering the trap drop the temperature and contract the X-Element. 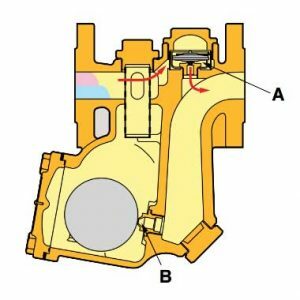 Valve port (A) instantaneously opens to discharge both air and condensate. When higher temperature condensate follows the X-element expands and closes valve port (A). When condensate flow to the trap ceases, the float closes valve port (B) which is always sealed below the water level. The upper section fills with steam and the X-Element closes valve port (A). The trap is then completely sealed, preventing any steam leakage. Only One Moving Part - the precision ground spherical float is the only moving part. Both float and sealing surface the Free Float is manufactured in a high quality process that produces almost perfectly spherical floats offering unmatched sealing performance even operating under strenuous process conditions such as low condensate flow at high pressures and temperatures. Energy Conservation - the valve orifice is positioned below the ‘water level’ in effect making use of a ‘water seal’ to eliminate steam leakage even under low load conditions. Process efficiency - the free float quickly adjusts to changing load conditions ensuring rapid discharge of condensate to keep the process at peak efficiency. Unaffected by back pressure the TLV Free Float is also ideal for applications where the condensate is to be recovered and utilised elsewhere in the system. Long Life - by using the whole Free Float as a sealing surface localized wear is prevented pro-longing the useful life of the steam trap. 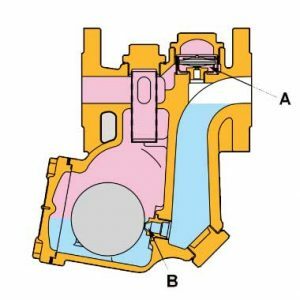 A built-in strainer also helps by protecting the valve from particulate ingress a reducing maintenance issues. Rapid start-up - all TLV Free Float traps include the means to automatically vent air on start up using either a bimetallic strip or a Thermostatic Module (x-element) enabling the removal of cold condensate, cold air and hot air improving the speed with which the system starts up and gets up to temperature. Easy maintenance - all free float traps with the exception of the SS3 and SS5 feature a design allowing easy in-line repair preventing the added problems of removing the steam trap from the process. If you need help selecting the correct steam trap for your particular application, please see our simple to use steam trap selection chart on Steam Select, our specialist steam equipment store: www.steamselect.co.uk. To view the complete range of products from TLV click the button below. For any further assistance with your system including sizing and selection of steam traps you can contact the technical team by email sales@valvesonline.co.uk or telephone 01822 855 600.